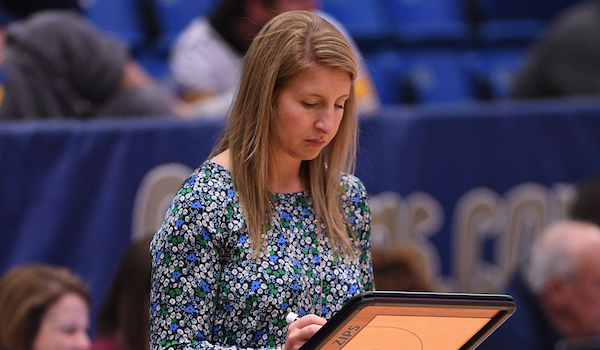 After 10 years as the Associate Head Coach and Assistant Coach at the University of Akron, Melissa Jackson was named Acting Head Coach for the program. In what she viewed as a two and a half month job interview, Jackson took full advantage of the opportunity, which lead to her being named the program’s Head Coach at the end of June. Can you take us through the process up until and your emotion once you were officially named the new Head Coach at Akron? My process was rather unique. I was named acting Head Coach in mid-April, after Jodi Kest announced her retirement. At that time my Athletic Director, Larry Williams, encouraged me to run the program as it was mine. I took that to heart and worked tirelessly on the recruiting trail, individual workouts with our current student athletes, fundraising, camps, and more. In my mind, I felt as if each day was an interview and an opportunity to show what Akron women’s basketball would be like under my leadership. I kept my AD informed by setting up weekly meetings with him. I would share if we got a commitment from a prospect or how individual workouts were going. I also documented everything and had a 30 day, 60 day, and 90 day plan in place and on paper. The process was long, about two and a half months, and included a formal on campus interview. When I was officially offered the job to say that I was elated would be an understatement. To see my team’s joyous reaction brought me to tears. There was also a big sigh of relief because of the amount of hard work, dedication and love I truly have for this program and University. What have been a few positives and challenges that come with moving from Assistant Coach to Head Coach within the same program? I think the biggest positive is the familiarity with everything; the players, recruits, administration, and campus. I didn’t have to take a campus tour or introduce myself to a million new people. I already had great relationships on campus, with our players, and with our recruits so I think that was very comforting for everyone. I also knew our players on-court strengths and weaknesses without having to watch film or wait for individual workouts. I think that gave me great insight as to what we needed to change. Another positive has been the familiarity with the league. The MAC is such a tough conference with great coaches. Being an Assistant Coach in this league for ten years has really helped in the transition. The biggest challenge, like any time you take over a program, is breaking people and players of what was done in the past. Even though I had been at Akron for ten years, there were many changes that I implemented right away. Another challenge was hiring a staff rather late. I was grateful that two loyal staff members stayed and I was very fortunate to hire some amazing people who have really helped me in this transition. It’s very important to surround yourself with great people. What steps did you take to change the mindset within the program that you were no longer the Assistant Coach, but Head Coach and put your own stamp on the program? I started implementing that change as soon as I was named Acting Head Coach. That first team meeting was crucial and I knew I had to really set the tone for the future. For the first time my players were now looking to me as the Head Coach and not the assistant. For me, it started with our culture and team values. These values are the backbone of our program. I believe you really have to be passionate about what you want your program to look like both on and off the court. I was passionate about the changes and I could feel the student athletes belief in what we wanted to change. That was also the same for the Xs and Os. For a long time I had studied the Princeton Offense on my own knowing when I became a Head Coach, if it was the right situation, I would implement it. I know our players can feel how passionate I am about our style of play and they have really bought in to this new style. After officially being a Division I Head Coach for the last couple of months, what advice would you have for Division I Assistant Coaches who aspire to become a Division I Head Coach one day? Wow there is so much I could say here. But I think one of the most important things to remember is stay true to who you are. Don’t try to be something you’re not. I’m a very positive coach, probably relentlessly positive at times and it works. It worked as an Assistant Coach and it works for me as a Head Coach. If I tried to be something different, I don’t think I would be very successful. My advice would be work hard, be loyal, and have a plan for when that opportunity comes. Be the most prepared you can be for every situation. Whether it’s end of game situations, marketing meeting, dinner with a booster; do your homework and prepare as best you can. You never know who is watching or taking notes. It may be the person who hires you in a few years.